The woodcut print shown here depicts a rural idyll northwest of Edo. A meandering river nourishes an expanse of rice paddies on the left-hand side. Two men are crossing a bridge, and more people are walking by the riverside. On the rising ground behind them, a cluster of thatched houses identified as “Ryuge-an (Dragon’s Retreat)” nestles amid pine trees. 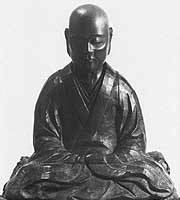 Having moved to Edo in 1672, Basho lived in Nihonbashi and devoted himself to establishing haikai as a true art form. As a newcomer to the bustling new capital of Japan, he was eking out a precarious living, aided by patrons who admired his poetry. Apparently he liked working in the farming countryside of Sekiguchi, where he enjoyed the views of rice paddies brimming with water from the Kanda. At Ryuge-an, a respected Zen monk called Sei’ei lived in a hermitage, and Tosei often visited him there to engage in long, heart-to-heart conversations. In 1680 he moved to Fukagawa on the forlorn eastern bank of the Sumida River. He so loved an exotic banana tree, or basho, planted by a disciple outside his riverside abode there that he changed his pen name to Basho. The “seasonal rain” is tsuyu, the Japanese rainy season, which came around in May in the old lunar calendar but now occurs in June. The Bridge of Seta, located on Lake Biwa, is a classic motif in arts and literature. 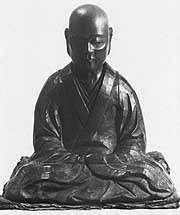 Still later, in 1744, a hall — the Basho-do in the woodcut print — was dedicated to a wooden statue of Basho. Now, both the memorial stone and the hall are in the Sekiguchi Basho-an. Four statues of his famous disciples — Kikaku, Ransetsu, Kyorai and Joso — are also enshrined there. Adjacent to the Basho-an, the shrine of the god of water, Suijin-sha, stands forlornly now, no more than a drab concrete affair dwarfed by a pair of huge ginkgo trees that are probably several hundred years old. Beyond the little shrine, Shin Edogawa Koen still looks much like it does in the illustration. Once part of the residence of the mighty daimyo lord of Hosokawa, the garden is subtly landscaped around a pond fed by groundwater seeping from the densely wooded hillside. For your visit, take the Yurakucho subway line to Edogawa-bashi Station and leave by Exit 1A. Cross the bridge over the Kanda River and turn left for a riverside stroll. After you pass by wisteria trellises, you will come to a short artificial stream spanned by a rectangular stone that marks the site of the Edo Period dam. With the advent of the modern water-supply system, the old dam was abandoned and demolished in 1937. Continuing on the wooded promenade, past the back of the Chinzan-so Hotel (Four Seasons Hotel), you will find Basho-an with its entrance around the corner. Though small, the garden is serene and safe from commercialism as its custodians’ primary concern is to convey the spirituality of Basho’s poetry. Open 10 a.m.-4:30 p.m., closed Monday. Call Manager Oba-san at (03) 3941-1145 (in Japanese) if you wish to see the usually closed Basho Hall. Shin Edogawa Koen, in the next block along the same riverside, also draws visitors attracted to its atmosphere of seclusion from the bustle of urban life. Large maple trees inside the gate and around the pond promise gorgeous autumn color, while a cool breeze from the wooded higher ground re-energizes the soul. Try to climb up the steep hillside for a feel of wilderness. Amid dense growths of evergreen oaks, a trickling stream runs around the base of an old tree, eventually flowing into the pond below. Open 9 a.m.-4:30 p.m.; closed for the yearend and New Year holidays. On your way back to the subway station, you might like a stopover at Chinzan-so, entering through its rear gate. The pleasant garden is more elaborately landscaped, with an ancient three-story pagoda, a large waterfall and a rushing stream revealed one after another as you go up and down along a circular path.